Is your nail gun getting on your nerves each time it jams for every 5 minutes? Does the cord and the air hose seem like they are following you all over the place? Then don't hesitate to check out Paslode nail guns. Established in 1935, Paslode technologies is today one of North America's leading producer of pneumatic and corded tools. Being one of the largest manufacturers of top class fastening tools, Paslode nail gun technologies have revolutionized the cordless nail gun technology. Compact build, great performance and commendable durability are a common characteristic of all Paslode nail guns. Their speed and performance hardly goes unnoticed. Their surprisingly minimal recoil spares a lot of strain on the wrists and hands. With sleek design and a battery that never seems to end, these nail guns come with a flexible exhaust (immensely convenient!!) and the rubber grips (this can prevent half the number of misfires) which have been built with almost all paslode models very well knowing the user's practical difficulties in mind. The depth of the drive adjustment is easy to handle. The Paslode nails are collated with paper and glue securing it completely from any exposure to water, sand, dust, etc unlike in most other company products. Though, some initial models of Paslode impulse nail guns had freezing and overheating problems which were overcome in the subsequent models, they sure do need careful handling. Quite a few of these nail guns fail to withstand rough handling and harsh conditions though the rest can take anything from -40 degree Celsius weather to a fiery sun blazing down it's back while it's shooting away nails into a frame. Sometimes these nail guns do fail to completely pin nails into extremely dry wood leaving the project looking a little unfinished. The bump firing option is a total failure as the nose trigger has to strictly be present if this function has to work. 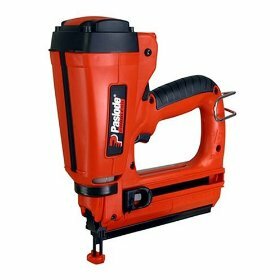 The major problem that makes the jerk in the Paslode technologies nail gun sales is the maintenance problem. All of their nail guns need timely care, however minimal it may be. They 'have' to be constantly oiled and cleaned. Since these guns work on a combustion chamber mechanism, there is a continuous carbon deposit build up which can pressurize the motor if left unnoticed over a period of time especially in the paslode impulse nail gun. The absence of a 'no mar'(which is a piece of similarly shaped rubber that is attached to the nose tip) tip can be bit of a problem while doing roofing work as the 4 pronged nose can leave behind marks around the fired nail. But the 4 pronged tip also works as the device's safety mechanism since it has to be released for the nail gun to start firing. Most of Paslode nail guns models cannot hold more than one coil of nails at a time, leaving professional users to think twice before they can use it in projects that may run into hours. Return From Paslode Nail Guns Page to Home - Finishcarpentryhelp.com.